Shares in Allergan fell after the company said it had swung to a loss in the last quarter of 2018, and forecast 2019 revenues below analyst expectations. The Ireland-headquartered specialty drugmaker, best known for its Botox wrinkle treatment, reported a loss of $4.3 billion that reversed a profit of over $3 billion a year ago, even though sales were a little better than expected at $4.08 billion. The loss resulted from big write-offs to the tune of a whopping $5.4 billion, in part resulting from lower-than-expected sales of double chin treatment Kybella/Belkyra – the main asset in the company’s $2.1 billion acquisition of Kythera – which brought in just $8 million in the quarter. It also revealed that it had dropped plans to sell off its female health division, which was put on the block last year along with its anti-infectives business. CEO Brent Saunders said on a conference call that it made more sense at the moment to continue “managing and optimising” the women’s health business, but that he still expected anti-infectives to be sold as planned. It’s possible that the volte-face on women’s health is related to the failure by Allergan to get FDA approval for uterine fibroids therapy Esmya (ulipristal acetate) last year, which had been tipped as a potential blockbuster. Approval would have made the division much more valuable. Allergan’s cash-cow Botox (onabotulinumtoxinA) had a good quarter, rising 9% to $946m, but its second biggest product – Restasis (cyclosporine) for dry eye disease – fell 18% to $341m thanks to the start of generic competition in some international markets, lower demand and pricing pressure. For the full year, the company is predicting net revenues of between $15 billion and $15.3 billion, which is a little lower than analysts’ projections. The fall-off in Restasis sales is likely to gather pace as patent protection is lost in other countries, particularly the US which accounts for 95% of its sales. US exclusivity for the drug is due to be lost in March of this year. Meanwhile, Botox is also facing the threat of biosimilar competition from US biotech Evolus, which resubmitted a marketing application in the US last August after its first attempt was rejected because of manufacturing issues. It’s hoping for a positive verdict from the FDA second time around in the spring. 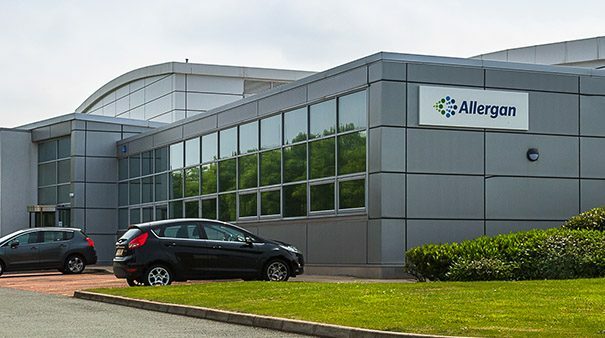 In a bid to protect its franchise, Allergan acquired privately-held biotech Bonti last year for an upfront payment of $195 million, gaining control of a new botulinum toxin ingredient with a rapid onset of action (within 24 hours) and a two- to four-week duration of effect. Shares in Allergan fell almost 9% after the results announcement to their lowest level for almost three years. Some analysts attributed that in part to what they perceived as downbeat discussion by Allergan’s management on NMDA-targeting antidepressant rapastinel, which is due to report pivotal data later in 2019 and is in a race to market with Johnson & Johnson’s esketamine.